Network management company Riverbed announced a definitive agreement to acquire Wi-Fi provider Xirrus, for an undisclosed fee. The move is just the latest in a string of acquisitions of standalone Wi-Fi companies, following Hewlett Packard’s purchase of Aruba in 2015 and the journeys of Ruckus Wireless, which was first bought by Brocade and is now on its way to being a part of Arris. 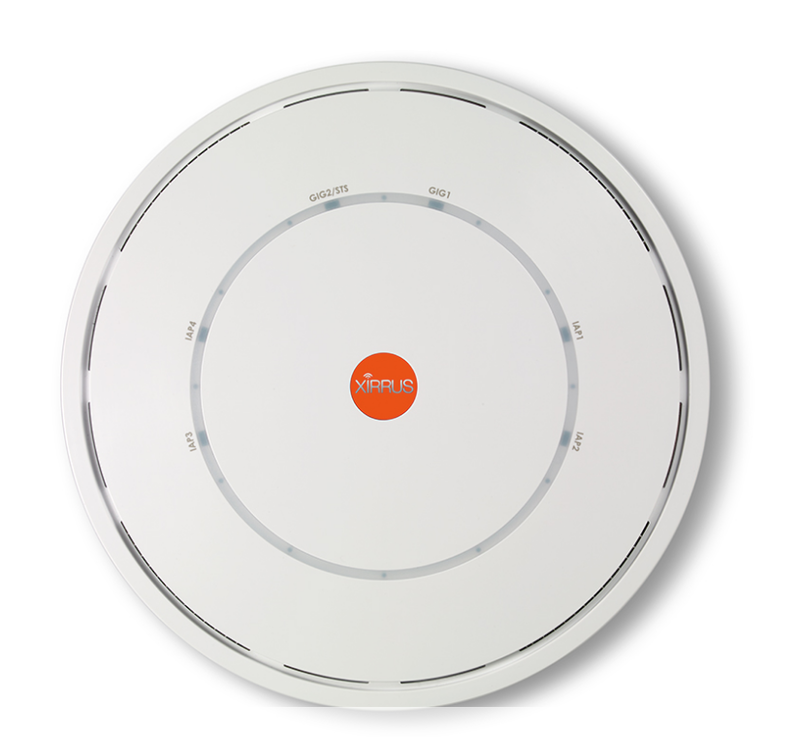 While Riverbed said it would continue to offer Xirrus’ Wi-Fi products as a standalone business, its interest in Xirrus’ Wi-Fi technology is most likely in the enterprise office market. 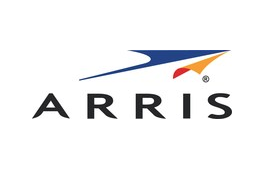 While nowhere near the size of players like Cisco or Aruba in the stadium wireless networking arena, Xirrus did have some wins in the space, including deals where its equipment was resold by Avaya. More as we hear more on the deal. If you’re building for the future, it’s best to start with a building for the future. 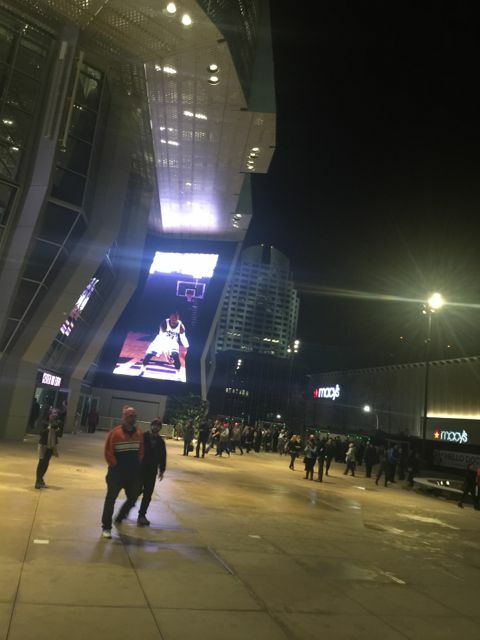 That’s what has happened in downtown Sacramento, where the Sacramento Kings have built a technology-laden future-proof arena, a venue designed not just to host basketball games but to be the centerpiece of a metro revival for years to come. Now open for business, the Golden 1 Center is a living blueprint for the arena of the future, especially from a technology perspective. And while some technology inside the venue is impossible to ignore — starting with the massive 4K scoreboard that overhangs the court — there’s also a wealth of less-apparent technology woven throughout the building’s core and pervasive in its operating functions. 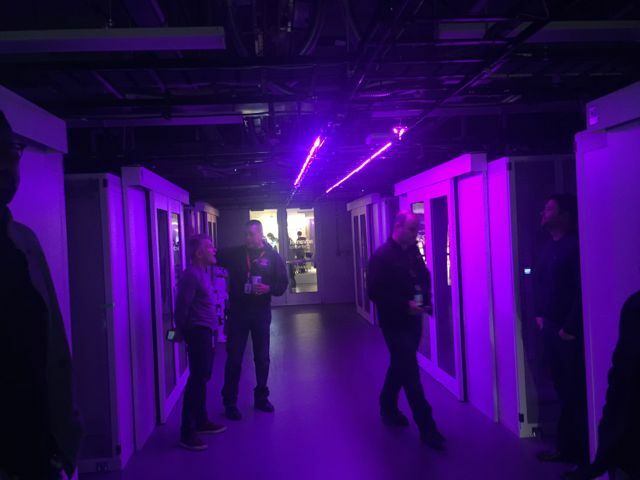 Led by Kings majority owner and former software company founder Vivek Ranadive, the technology-focused direction of the new arena is a blend of the latest thinking in venue experiences and operations. Among the many got-to-have staples: High-quality wireless connectivity and multiple mobile device-based services, including food ordering and delivery, map-based parking, wayfinding help, and digital ticketing. 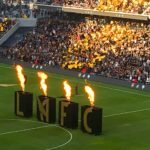 While its already-available options easily place Golden 1 Center among the top tier of connected stadiums today, what may be more impressive is the internal planning for future technologies and services, a sign that its owners and operators clearly understand the ever-changing nature of digital systems. While the arena is open today, it’s still somewhat of a diamond in the rough, as planned surrounding structures, including adjacent hotel and retail outlets, are still in the concrete-and-cranes phase, with “coming soon” signs on the area’s many construction fences. As they wait for their team to show signs of on-court improvement, Sacramento citizens must also be patient for the full plan of the downtown arena to emerge, along with its promise to revive an area once stuck in the past. The good news? With Golden 1 Center Sacramento fans already have a winner, in a venue that will provide fans with some of the best digital-based services and amenities found anywhere, for now and for the foreseeable future. 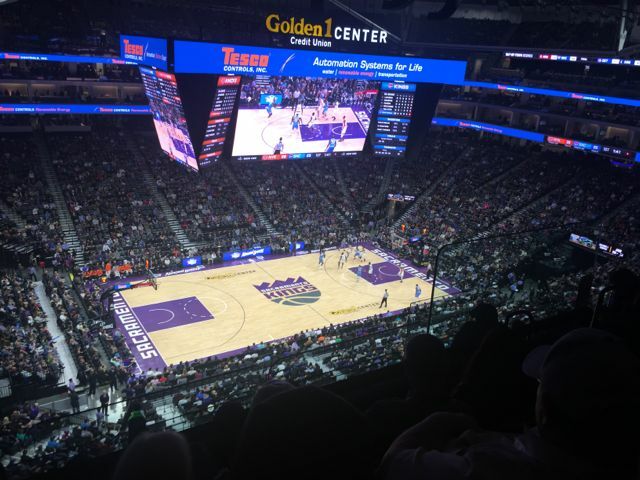 What follows are our first impressions from an early December 2016 visit to a Kings home game, hosted by representatives of the Kings’ technical staff along with representatives from Wi-Fi gear provider Ruckus and cellular DAS deployment firm DAS Group Professionals. Editor’s note: This profile is from our latest STADIUM TECH REPORT, the ONLY in-depth publication created specifically for the stadium technology professional and the stadium technology marketplace. Read about new networks at the Indiana Pacers’ Bankers Life Fieldhouse and the new Wi-Fi network used for the Super Bowl in our report, which is available now for FREE DOWNLOAD from our site! 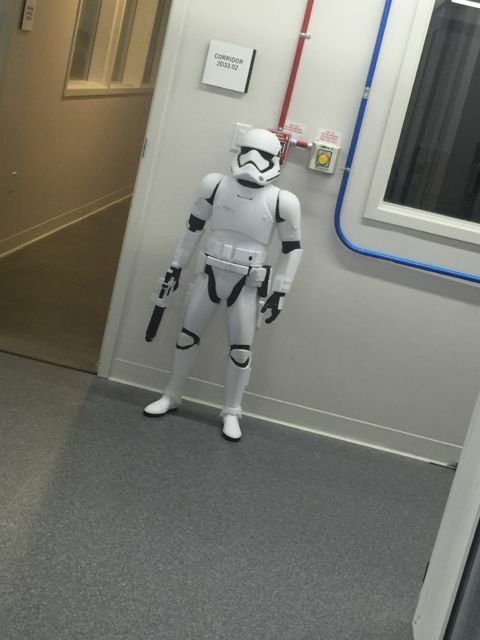 Data center guards. Small, but well armed. If you had any doubts about how proud the Kings are of their stadium technology, those are erased the moment you enter the stadium via the VIP doorway; after the metal detectors but before you hit the new-wave ticket scanners, you see a set of floor-to-ceiling glass walls and doors to your left, showing off the impressive racks of the venue’s main data equipment room. How can gear racks be impressive? How about if they are impeccably encased in their own white metal and glass enclosures, a technique that allows the Kings to refrigerate each rack separately, leaving the rest of the room at a temperature more suitable to human bodies. You don’t have to be a network equipment operator to recognize an over-the-top attention to detail here; even the exposed fiber cabling that stretches out up and across the ceiling is color-coded in the Kings’ main team purple; another level of coolness appears when the main lights in the room are turned off, and more LEDs come on to bathe the room in a completely purple hue. This room is also where you see the first hints of how the team is preparing for the future, with two 100 Gbps incoming bandwidth pipes (from Comcast), as well as two full rows of racks left empty, waiting for whatever innovation needs arise next. While the backbone bandwidth will eventually also support the nearby hotel and retail locations, twin 100-Gbps connections should provide adequate throughput for now and the foreseeable future. Walk a few steps past the mini-sized Imperial Stormtroopers who guard the facility and you are in a hallway that separates a “mission control” room with monitors for a huge number of operational services, and the video control room. The innovation here starts simply with the side-by-side proximity of network, operations and video administration rooms, a rarity especially in older stadiums where coordination between people working in such rooms often meant walkie-talkies and lots of running around. Multiple live video inputs in the “control room” at G1C. 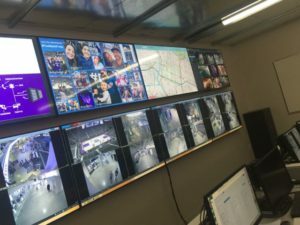 While the video control room and its need to supply coordinated content to more than 800 monitors in the building (as well as to the app) is impressive, what’s really interesting is the “mission control” room, where Kings employees, network types and public safety personnel can track multiple inputs on a wall of monitors. In addition to security and public service video monitoring (Kings reps talk about seeing fans spill a drink and hustling to deploy clean-up services before anyone can ask for them), there are also displays for real-time social media mentions and live traffic information, which the Kings can monitor and respond to as needed. 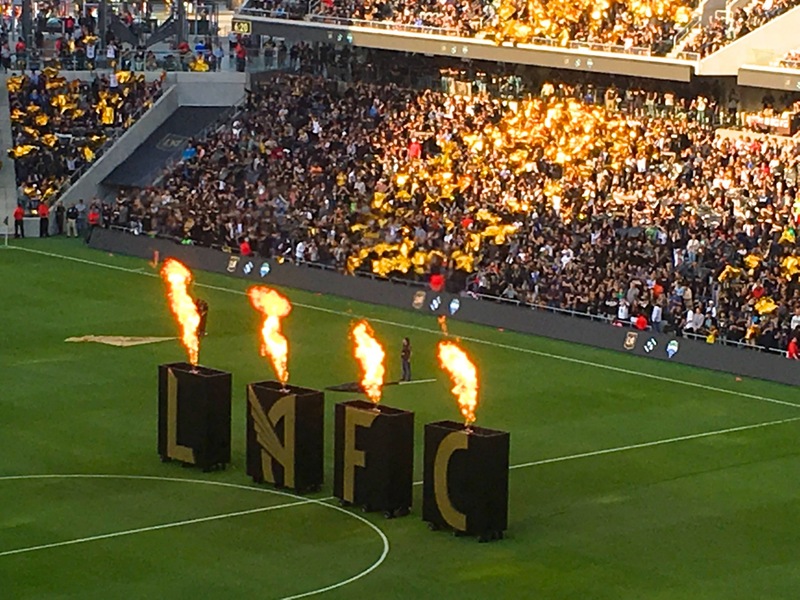 Another “unseen” technology innovation is an operational app that provides real-time access to a huge list of game-day business statistics, like live ticket-scan numbers and real-time updates to concession purchases. 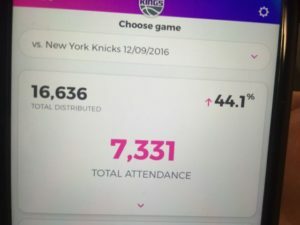 This app is also available to Kings execs on their mobile devices, and it’s addicting to watch the numbers update in real time, especially the fast-moving alcoholic beverage purchase totals; according to the Kings, during a Jimmy Buffett concert at the arena, adult-beverage purchases were pushing the $1,000-per-minute mark. 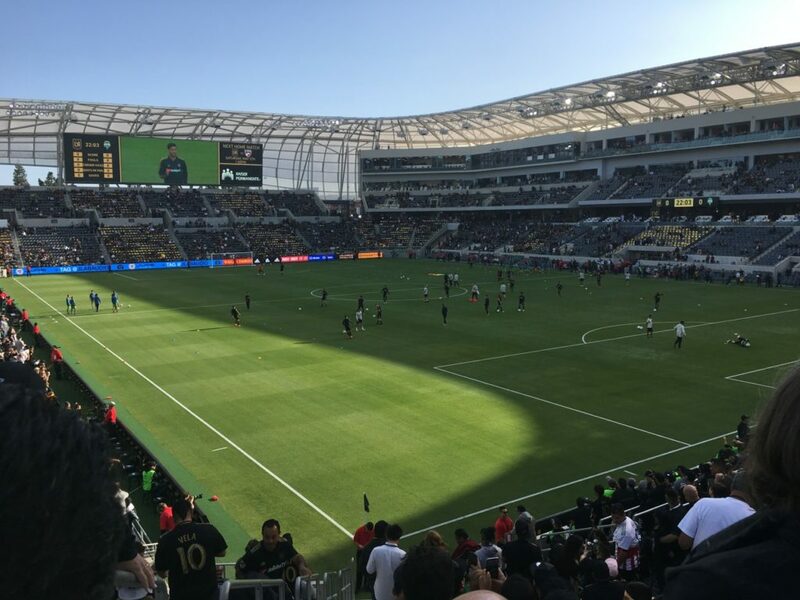 When it comes to the fan experience, such “hidden” technologies may be the services that provide the best examples for how high-quality networks can bring real ROI to stadiums and large public venues. Fans may never know the guts of the system, but when a stand doesn’t run out of hot dogs or a clean-up squad arrives quickly to mop up a spilled beer, it’s a good bet that customer satisfaction will keep increasing. 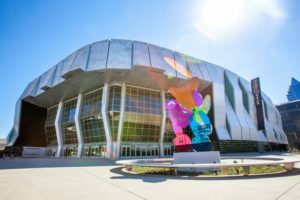 With massively connected systems and attached real-time analytics, such services become easier to deploy and manage; at Golden 1 Center, it’s easy to see how multiple stakeholders in the venue benefit from the decision to make networked technology a primary core of the building’s operations. The huge scoreboard dominates the view at Golden 1 Center. Taking an elevator up to the main concourse floor, the initial impression of Golden 1 Center is its openness — it is built so that the main or ground level entrance is at the top of the bottom bowl of seats, with court level below. Open all the way around, the ability to see across the venue gives it an airy feeling, more like a bigger enclosed football stadium than a basketball arena. On the night we toured the venue its unique glass entryway windows were closed, but they can be opened to let in the breeze during milder days — adding another degree of difficulty for wireless network administration, since LTE signals can both enter and leave the building when the windows are open. The next thing to catch your eye is the main scoreboard, which the Kings bill as the biggest 4K screen for a permanent indoor arena, with 35 million pixels. If it were lowered during a game, the Kings folks claim the screen would touch both baskets, so without any other numbers you get the idea: This thing is huge. New entry kiosks from SkiData move more fans inside more quickly, the Kings claim. It’s also incredibly clear, thanks in part to the 4K resolution but also in part to the fact that it is tilted at just the correct angles so that it’s easy to glance up from live action for a look at either the main screens or the bordering screens on both sides. 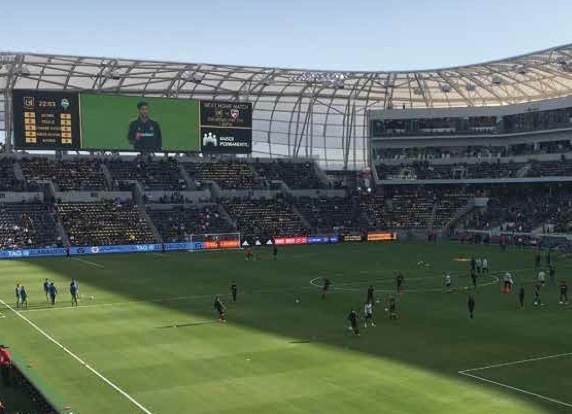 Just citing clarity or size for scoreboards, I think, is missing a critical factor for video boards — what really matters is whether or not the screen is a positive or negative factor for during-game viewing, a subjective measurement that may take time to sink in. First impressions, however, during the live action between the Kings and Knicks during our visit, were incredibly positive, with the screen not interfering with live action views but incredibly clear for replays and live statistics. The next part of our tour was to see if we could spot any of the 931 Ruckus Wi-Fi APs that are installed inside the venue. With the clear emphasis on clean aesthetics it was hard to spot any of the wall- or ceiling-mounted units, but we were able to locate several of the many under-seat AP enclosures, including some on retractable seats. 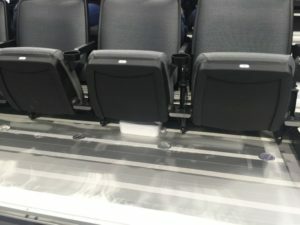 According to the Ruckus folks on hand the retractable-seat APs took a little extra engineering, to allow the devices to be disconnected during seat movements. 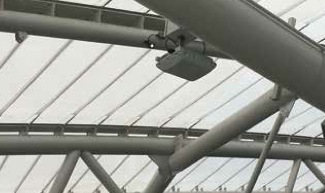 The JMA Wireless DAS equipment was a little easier to spot, since like at Levi’s Stadium there are a number of antenna placements around the main concourse, pointing down into the lower bowl seating. 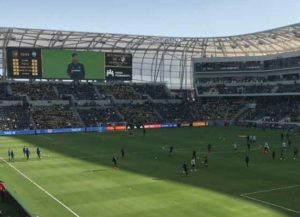 The DAS Group Professional representatives on hand also pointed out more antennas up in the rafters, as well as some specially designed “antenna rocks” that hide cellular equipment outside the stadium in the open-air plaza. According to DGP and the Kings there are 136 DAS remote placements housing 213 antennas; right now only AT&T and Verizon Wireless are active on the DAS, with T-Mobile scheduled to join before the end of the NBA season. Negotiations with Sprint are still under discussion. 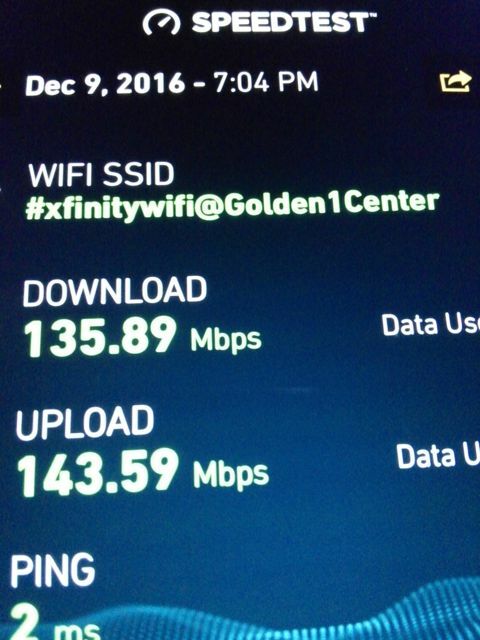 When we dropped back down to the court-level to see the locker room entrances and one of the premium-seat club areas, we took our first Wi-Fi speed test at Golden 1 Center, and almost couldn’t believe the result: We got 132 Mbps for the download speed and 98 Mbps for upload. Greeted a few minutes later by owner Ranadive himself, we congratulated him on getting what he wanted in terms of connectivity, a theme he relentlessly promoted during the arena’s construction phases. That’s good Wi-Fi. Taken in the Lexus Club on court level at Golden 1 Center. The Wi-Fi connectivity was superb throughout the venue, with readings of 51.35/22.21 on press row (located at the top of the main lower bowl, just in front of the main concourse) and 42.14/38.83 in the crowded Sierra Nevada brewpub club at the top level of the arena. 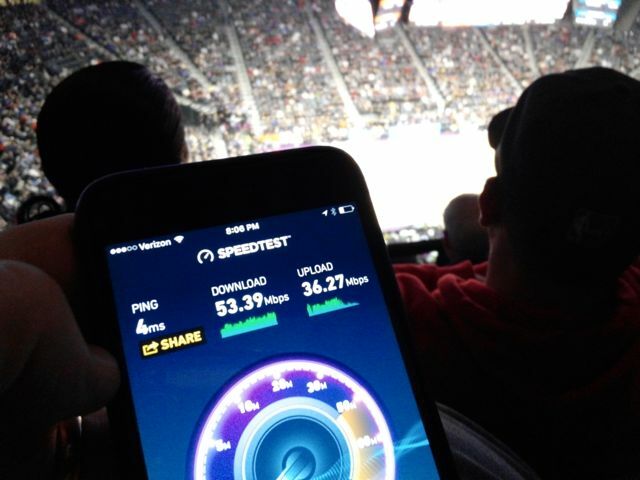 In section 220 in the upper deck we got Wi-Fi readings of 53.39 Mbps for download and 36.27 for upload. Throughout the stadium the Verizon LTE signal was in low teens to 20 Mbps range on the download side and usually between 20-30 Mbps on the upload side. 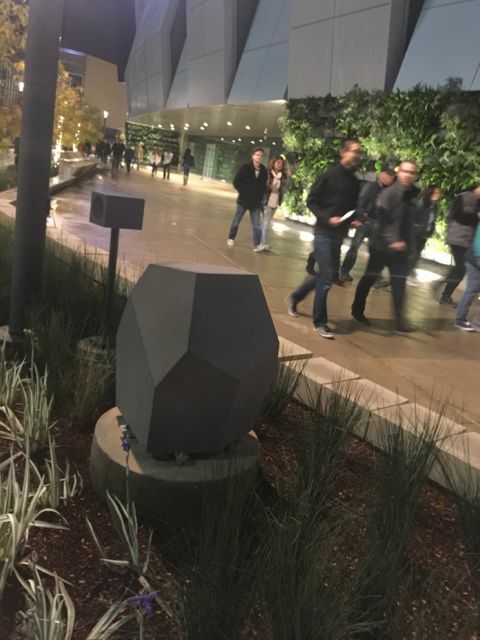 One of the decisions the Kings made on the Wi-Fi side was to drop 2.4 GHz coverage for fan devices in the main bowl area. 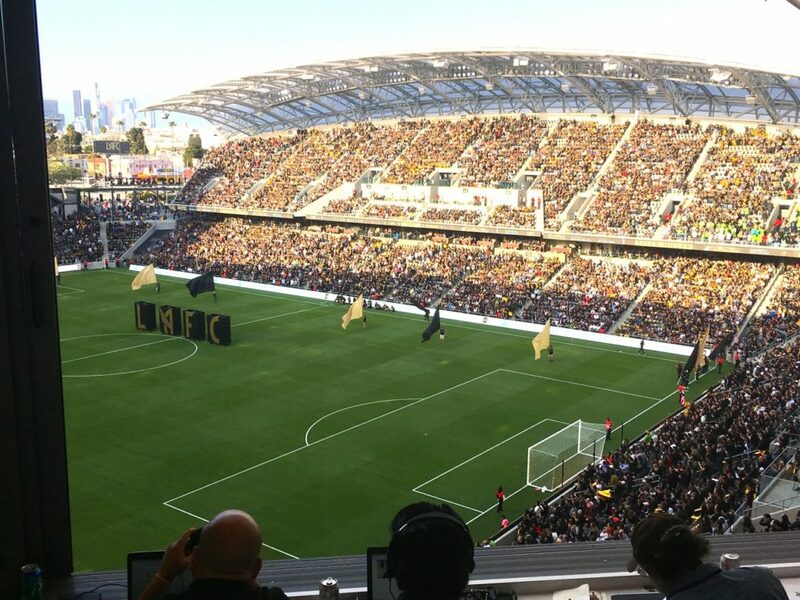 According to both Ruckus and the Kings, fan devices now are almost 90 percent 5 GHz capable, meaning that it makes administrative sense to take 2.4 GHz out of the main fan Wi-Fi equation (while still keeping it for back-of-house operations like POS and wireless wristbands and cameras, which all still use 2.4 GHz technology). Other teams in the NBA, including the Indiana Pacers (who also recently installed a Ruckus Wi-Fi network) have also said that they are getting rid of 2.4 GHz coverage for fans since most devices used today have 5 GHz connectivity. While we didn’t have time during this visit to explore all the numerous services available through the team’s app — including a game that lets fans bet loyalty points on predictions about which players will score the most points — it was clear that many fans were taking advantage of the connectivity, especially in the brewpub area where handy lean-up railings with small shelves made it easier to operate a mobile device while still being somewhat engaged with the court action below. Team execs can get live feeds of fan-related stats on their internal app. 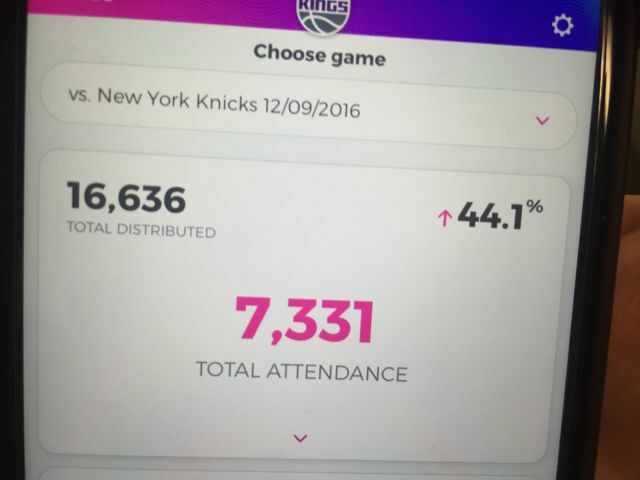 According to the Kings, during the first regular-season home game on Oct. 27, 2016, there were 8,307 unique users of the Wi-Fi network, out of 17,608 fans in attendance. 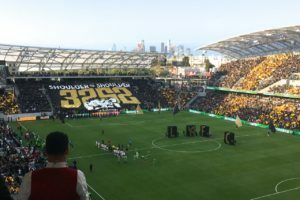 The connected fans used a total of 1.4 terabytes of data on the Wi-Fi network that night, with a top peak concurrent connection number of 7,761 users. 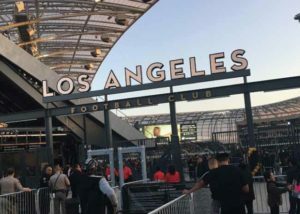 The highest sustained traffic to the Internet that night was a mark of 1.01 Gbps for a 15-minute period between 7:45 to 8:00 p.m., according to the Kings. Another technology twist we saw in the brewpub was the use of Appetize’s flip-screen POS terminals, which allows for faster order taking simply by letting fans sign on screens with their fingers. Back at the front gates, the new ticket-scanning kiosks from SkiData may take some time for fans to get used to, but even obvious first-timers seemed to quickly understand the kiosk’s operation without much help needed, thanks to the helpful instructions on the wide screen that greets fans as they encounter the device. 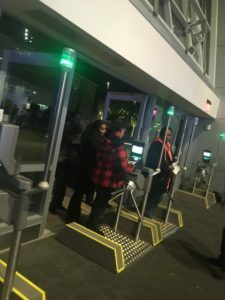 According to the Kings, tests of the new kiosks at other venues have shown that they can be as much as three times faster than previous technologies, good news to anyone who’s ever had to wait in line just to have their ticket checked. 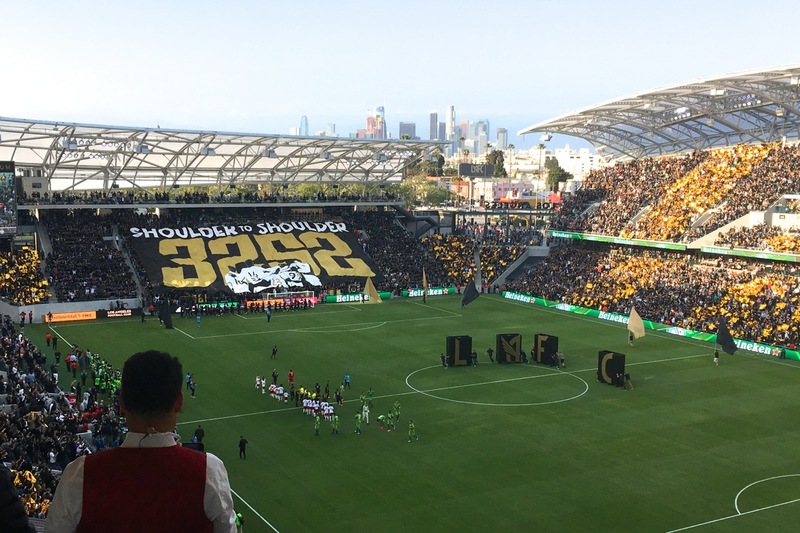 A view outside the stadium’s main entrance, with one of the two large vertical video boards visible. Even in the face of mulitple years without playoff teams, Sacramento fans still turn out for the Kings; the point here in regards to technology is that it may take time for fans to notice and embrace the finer points of all the technological attributes of their new arena, which should become more than just an NBA venue as more concerts and civic events are held in and around its environs. 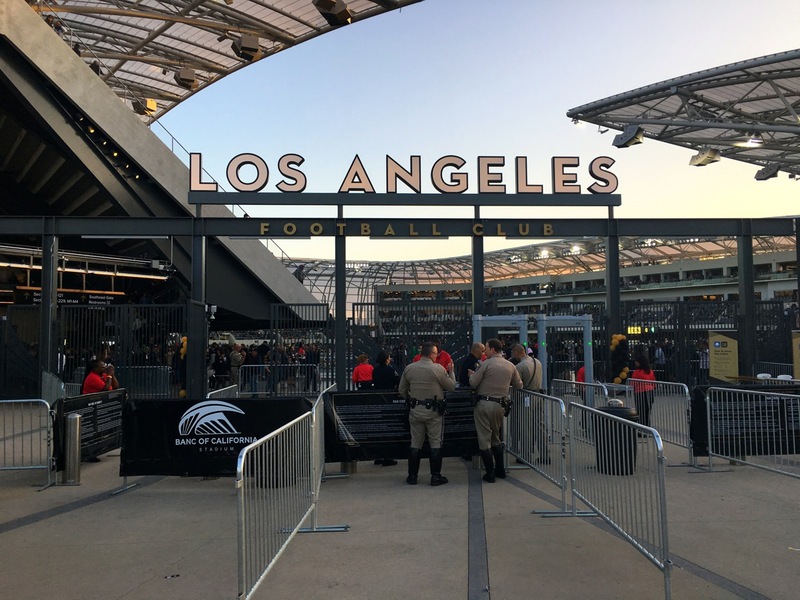 Our quick take is that fans may turn faster to services like the traffic, parking and seat-wayfinding features in the app, simply due to the newness of the building to everyone, as well as its tightly sandwiched downtown location. 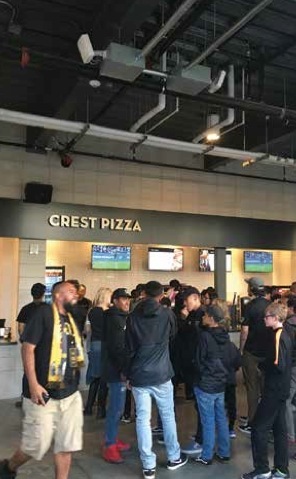 Like in other new arenas, the jury is still out on other app-based services like the loyalty-points voting game, and in-seat concessions ordering and delivery; the Kings declined to provide any statistics for in-seat ordering and delivery, a service which became available to the entire stadium on the night of our visit. The Kings, like many other teams, also offer instant replays via the app, but with the numerous high-quality big-screen displays (including two arena-sized screens outside the main entryway) it will be interesting to see if fans ever see an overwhelming need to check their devices for live action while attending a game. The good news for the Kings is that they based their stadium and team app on a new flexible platform from a company called Built.io, which the Kings say allows for easier addition (or deletion) of services through an API layer. Like the future-proof parts of the building itself, the app also shows the Kings’ dedication to building something now that will almost certainly change going forward. 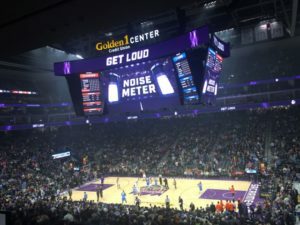 As we look to the future it will be interesting to see which parts of the technology base contribute most to the fan experience and business operations at Golden 1 Center — and to see how many other existing or new arenas follow the lead. More photos from our visit below! 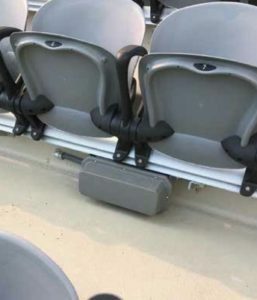 Under seat Wi-Fi AP on a moveable section of stands. The view from upper-deck seats. 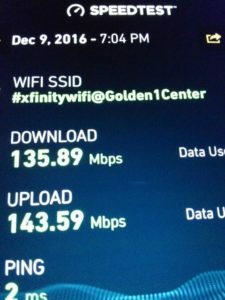 A Wi-Fi speed test from those same seats. One of the “rocks” hiding DAS antennas on the outside walkway. 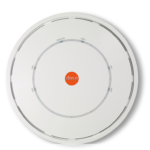 The wireless networking business once known as Ruckus Wireless is finding a new home, as Arris announced today that it plans to buy Ruckus from current owner Brocade as part of an $800 million deal that also includes Brocade’s ICX switch business. Brocade, which purchased Ruckus for $1.2 billion earlier this year, is being acquired itself, by chipmaker Broadcom in a $5.5 billion deal announced last November. According to an Arris release, the deal will be completed when Broadcom’s purchase of Brocade closes, an event expected to happen at the end of July. 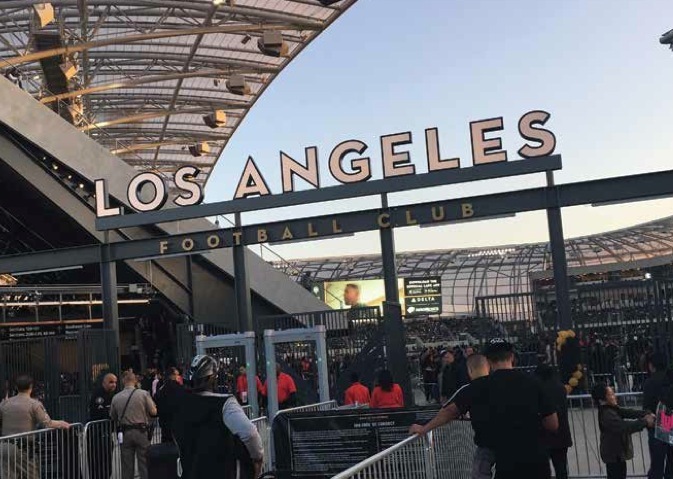 We’ve got some calls in to see what, if anything, will happen to the growing stadium networking business at Ruckus, which in the past year has seen Ruckus Wi-Fi gear in arenas like Bankers Life Fieldhouse in Indianapolis and Golden 1 Center in Sacramento. Stay tuned!